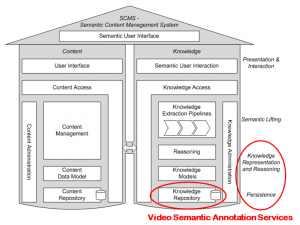 The goals of the Semantic Video Annotation use case (a.k.a. multimedia use case) are to derive business-specific requirements with respect to a typical scenario related to the Polymedia context. This leads in turn to the second goal: to show how IKS technology can provide added value to our existing video CMS tool, part of KIT cosmos, by empowering it with semantic capabilities. A third goal is to point at technical difficulties impacting on the integration of the desired functionalities within our commercial, closed product. We started by designing a use case that fits the industrial needs, beginning with the editing phase, completing it by exploring ways to exploit the semantic capabilities introduced, through a player. Below is an overview of the scenario. The journalist, in the editorial office of a website dealing with cinema, using a video annotation software adds semantic tags to the various stages of the considered movie, for example the location where the scene was shot or the actors that are present on stage (see figure below). Once finished, the edited video, including the performed annotations, is saved in the internal repository. The journalist who will review the annotated movie, or the generic end-user, will have the chance to playback the video (using a compatible player) watching the multimedia stream while a set of additional information linked to the semantic metadata are displayed in real time. For example pictures of an actor present into a scene or the details about the location where the scene was shot (see figure below). 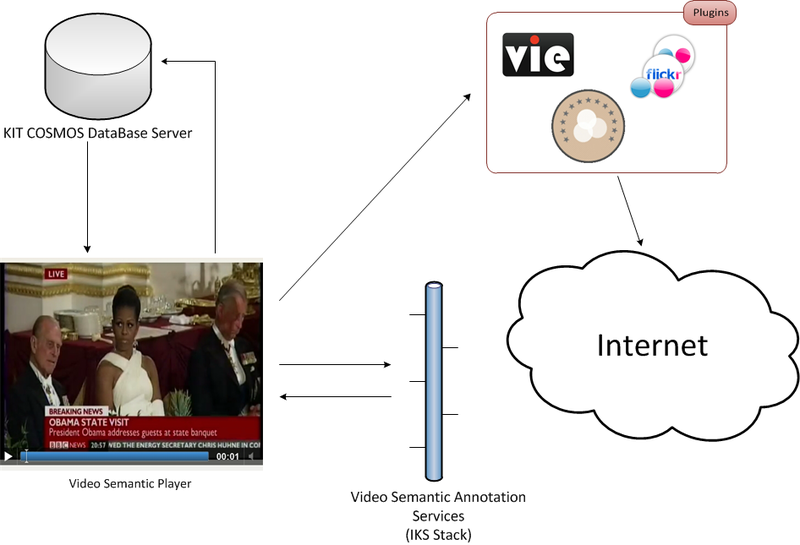 Video Semantic Annotation metadata and services have been developed as an open-source addition to the Stack. After an evaluation phase considering different metadata formats (Media Fragments, Event Ontology, Ontology for Media Resources), including a proprietary one (by Polymedia), we decided to adopt the open source implementation of the popcorn.js framework. First of all it shares similarities with features envisaged as requirements, moreover it is already supported by OSS player components and related plug-ins. The concept of “Resources” is very important since referring to plug-ins running on the player and triggered automatically when parsing the annotated video. A plugin is referenced by name, as an XML tag, and all its options follow as XML attributes; in and out attributes in the XML are the same as start and stop options in the plugin. popcorn.js framework provides a set of already existing plug-ins that can be extended by custom one. We took advantage of both. Provided the above considerations, below is the high level architecture describing the various actors and components interplay. 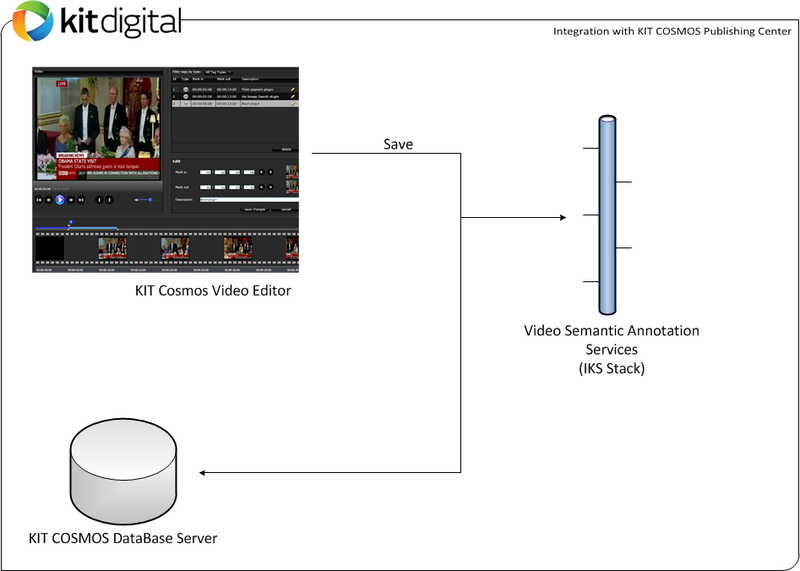 Both the editor and the player integrate with IKS through the video semantic annotation services. 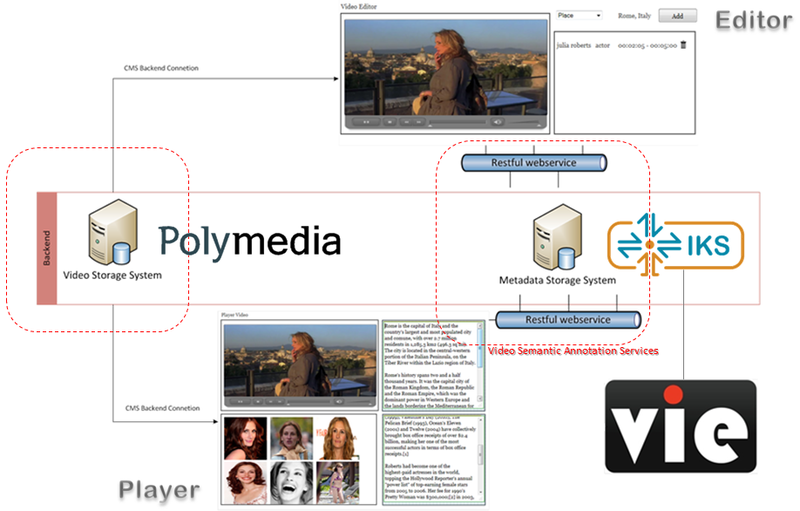 Store metadata related to the editing phase within the Polymedia CMS internal DB Server. Trigger Video Semantic Annotation services in order to store the annotated video segments using key, value pairs. The startup phase is about retrieving the video metadata by invoking Video Semantic Annotation services and, in turn, by opening the connection with the Polymedia Streaming Server for the video content referenced by the metadata file. The playback phase, on the other hand, is about playing back the streamed video content, parsing the metadata file in real-time and triggering the configured plug-ins to produce the enriched output. The demo is also available online. Since based on a production environment the access is limited: if you’re interested in it please contact me. Improving the player UI is another step we would like to perform. At the current stage the front-end is minimal and we would like to have something nicer to present during road show activities in 2012.